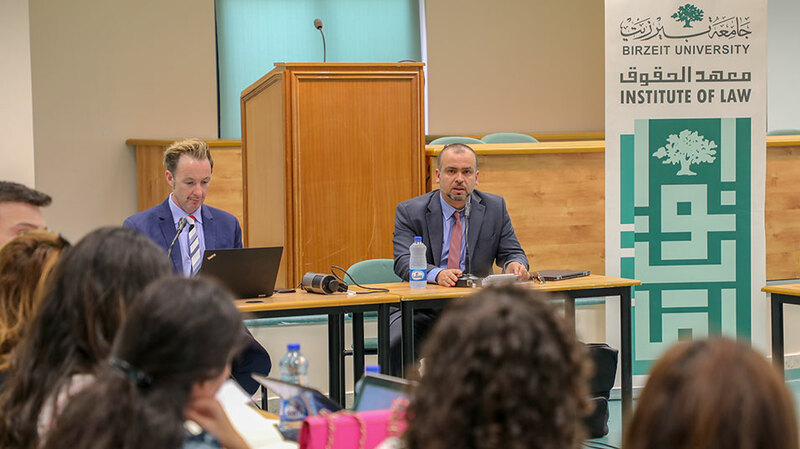 The Institute of Law at Birzeit University, in collaboration with the “Junior Palestinian Legal Experts Network" and with the support of the Sheikh Hamad bin Khalifa Al Thani Chair for Constitutional and International Law, organized a round table discussion which featured Ralph Wilde, a professor at University College London and an expert in public international law on Wednesday, August 8, 2018. The round table session, attended by representatives from human rights organizations and Birzeit University researchers, law students, and graduates, was held to discuss Wilde’s recently published report on the applicability of human rights law in the occupied Palestinian territory. Wilde presented the main issues tackled in his report, which centers on the respective responsibilities of Israel, the extraterritorial state, toward Palestine, the occupied state, with a focus on the right to self-determination. The discussion was chaired by Vice President for Community Affairs and Acting Director of the Institute of Law Asem Khalil, who gave a brief introduction on the "Junior Palestinian Legal Experts Network" and its efforts in disseminating and promoting the Palestinian perspective in international public law and resisting attempts to conceal and ignore it. Certificates of participation were distributed to all participants at the end of the discussion.